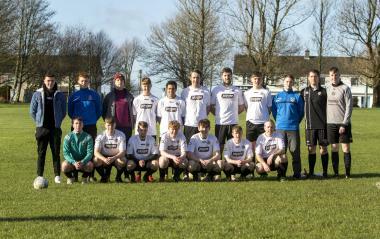 The junior men’s side (pictured) drew 2-2 away to Renmore B last Saturday afternoon with the point gained moving them level with NUIG at the top of Division Three. Renmore were in front after only five minutes but United missed the opportunity to score before the break when the home keeper saved well from a Patrick Phillip’s penalty. However, in a hectic ten minute period after the restart, Craughwell levelled when Jack Lally set up Chris Phillips to score before Renmore went in front again almost immediately. Darragh Minogue wasn’t long setting up Phillips for his second to level the match at 2-2 and while both sides went close in the final quarter there was to be no separating the sides on the day. Best for Craughwell were keeper Kyle Heverin who made some outstanding saves in the second half and midfielder Jack Lally who attacked and defended with equal prowess. Also on Saturday, the U14 boys were 3-1 winners away to Tuam Celtic B in their Divisional Cup first round encounter. Craughwell fell behind very early on but equalised through a very composed finish from Aaron Crowe. United took the lead from the penalty spot as Daire Crowe slotted home and then Liam Plower put the game to bed with a cool finish. Best for Craughwell were Alan Zimmerer who was excellent throughout and Jamie Lyons who was outstanding between the sticks. On Sunday the U16 boys were defeat 4-2 away to St Bernards in first round cup action with Lewis Ryan and Jack Regan on target for United.